Upload backup from your personal computer. Click to restore data from the selected backup. Click to download selected backup file from server to your personal computer (we advise you to use this function once or twice a month). Click checkbox, then Create backup and include data from all TE3 logs, data for referrers… (such files are extremely comprehensive, especially if you manage a large site - we recommend “standard” backup instead). 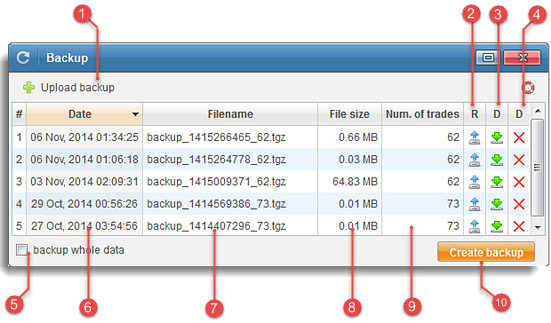 Creation date of backup (calculated from Unix Time Stamp). Consists of three parameters: backup_Time Stamp_Number of trades.tgz (e.g. backup_1405349220_80.tgz). We advise against renaming backup files - file date is calculated from Time Stamp within file name and it will no longer be valid). Number of trades in your database. You should only use backup in case of a data loss event. Note, that after you initiate Restore all settings will be configured according to data from the selected backup and statistics will probably no longer be current (use Reset function of Mass edit panel).